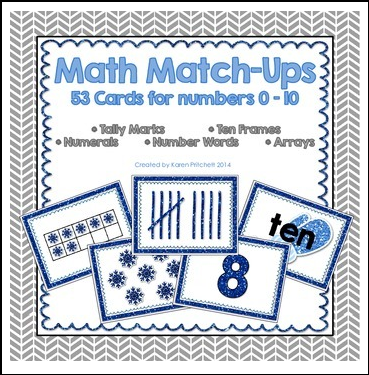 53 Winter themed flashcards for matching games, sorting, and centers. Covers tally marks, number words, ten frames, numerals, & number of objects. Numbers to 10. These cards are perfect for matching tally marks to numerals, numerals to number words, ten frames to numerals, number of tally marks to number of objects, or any combination you choose! You can use these cards as a concentration game or for various card games. The activities are endless! I made these as printer friendly as possible! The fun glittery blue graphics really pop when printed on white card stock. I tried to include as much "white space" as possible on the cards, and there are 9 cards on each page to reduce paper waste. The size seems to be perfect for my students. I hope you find these cards helpful with your centers and small group work!